While leaving seemingly take weeks, the moment hinges on just a few hours of drive time and wait time. After a long list of good-byes and one more fantastic meal shared in their home, the Harrington's laid to rest for their final Galma-sleep. On the morning of August 26th the Harrington's faced the moment-that-could-wait-no-longer, finished cleaning their apartment, loaded up in the car with Hyunhee, Hakcheol and of course Lady Annyeong. Driving north to Incheon, the Harrington's (well...Melissa primarily considering Mike was feeling a bit motion sick) discussed various of aspects of Korea they were sad to leave and last minute concerns that maybe they forgot something to ensure Lady was USA ready. However, they desired more than anything for these last hours with some of their greatest friends to be full of nothing less than beauty and joy. Hyunhee and Hakcheol contributed greatly to the truth of this beauty by providing Plum Pie for breakfast, some fresh fruit and their presence during the majority of the Harrington's final Korean hours. Upon arrival at Incheon International Airport, the Kim's even presented the Harrington's with a thoughtful (albeit a bit scandalous) gift of a matching underwear set - something Melissa had been eying since first landing in the land of the morning calm. With little room to spare, the couple would eventually have to unwrap and shove the 'unmentionables' into their carry-on. 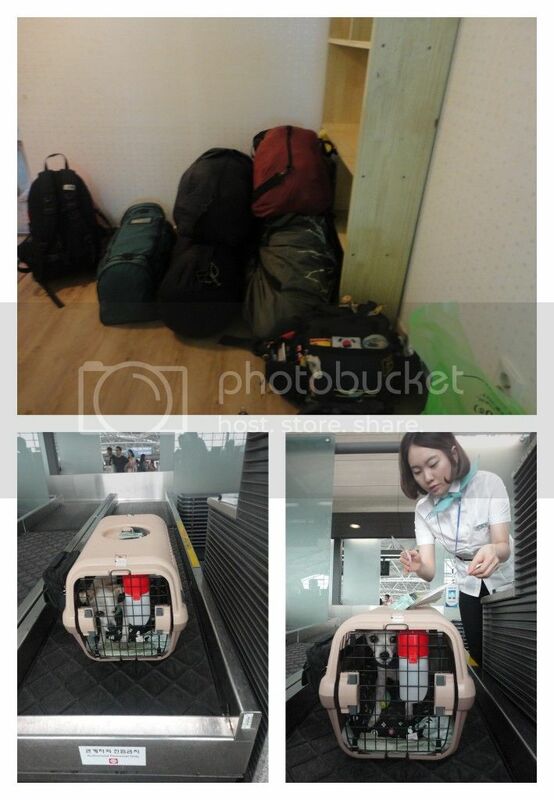 However, before making final luggage arrangements the couple hauled their sweet little pup to the quarantine office of Incheon International Airport. Nervous that they had forgotten some crucial piece of information to transfer Lady Annyeong to the USA the couple was thrilled to discover that in fact, all that was needed was recent documentation of rabies vaccination which in turn earned the couple a more official document claiming recent rabies vaccination and with that, Lady was ready to begin what was likely a terrifying journey. Feeling increasingly confident that Lady Annyeong would in fact be their forever connection to the land of kimchi, the Harrington's sadly handed her over to the care of Korean Air, wished her well and promised that we'd be seeing her soon. With everything taken care of and squared away it was time for the crew to snap a few pictures, grab a quick bite to eat, hug and go their separate ways, the Kim's back to Daejeon, the Harrington's back the USA.